The Happy Returns Daylily is a re-blooming daylily from end of May through September. In order for the daylily to continue blooming, however, it needs to be deadheaded, i.e., removal of the spent flower. If deadheading is not done, the plant puts its energy towards making seeds and not more flowers. Deadheading is very important to continue to produce more flowers. Another reason the daylilies may not be producing flowers is the hot weather. High temperatures, humidity and dry soil are all things that stress the plants. If the plant is stressed, it will not produce flowers since it takes a lot of energy on the part of the plant to produce flowers. Once the cooler weather returns, the daylilies will begin blooming again. If we are not receiving adequate natural rainfall, you will have to water deeply at least once a week since watering also supports flowering. 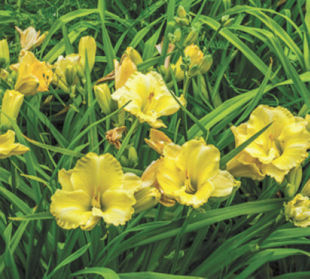 If the daylilies were being deadheaded on a regular basis and had proper moisture in the soil and never produced flowers, that's when it would be time to divide them.